While participating in the taping of an upcoming episode of the PBS show Finding Your Roots, House Speaker Paul Ryan found out that genetic testing confirmed that he is 3% Jewish. The show's host, Henry Louis Gates Jr., shared the Wisconsin Republican's reaction to discovering his roots during a panel on Tuesday. "You could have knocked him over with a feather and then he was very proud of it," Gates, who also serves as an executive producer on the show, said during the Television Critics Association press tour in Los Angeles. A publicist for the show confirmed Gates' comments during the panel, and Ryan's upcoming appearance on the show, in an email to CNN. "We don't know who that Jewish person was, but we know it was on his mother's German line, which makes sense," Gates continued. "So somebody who was a Christian German slept with a Jewish German person and that's where that came from." In a tweet on Wednesday, Ryan, who is Catholic, seemingly hinted at finding out about his roots. "Guess I need to start saying 'L'Chaim' now, too!" he tweeted, attaching a GIF of himself holding up a drink. He did not reference the show itself in the social media post. 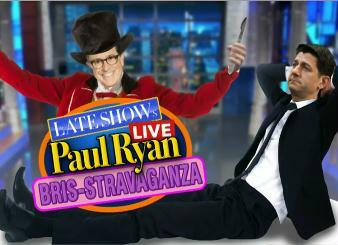 Late night talk show host Stephen Colbert rushed in to offer Ryan a "Bris-Stravaganza" with mohels standing by. Here's the Colbert video clip. Enjoy!